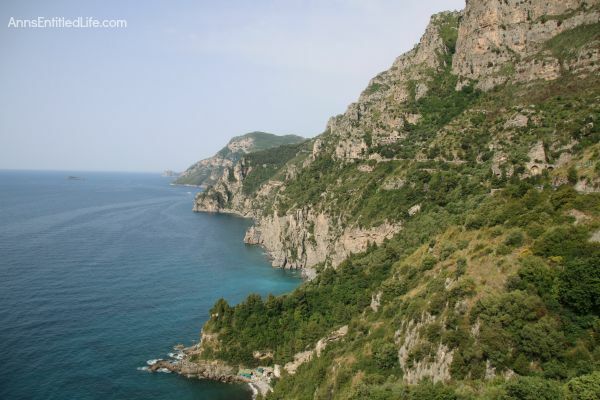 The Amalfi Coast is a stretch of coastline on the southern coast of the Sorrentine Peninsula in southern Italy. 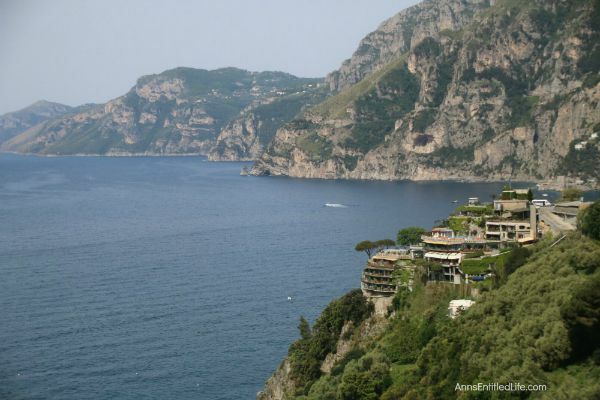 Known for hosting the rich and famous, Amalfi is beautiful, fairly isolated, and crowded! 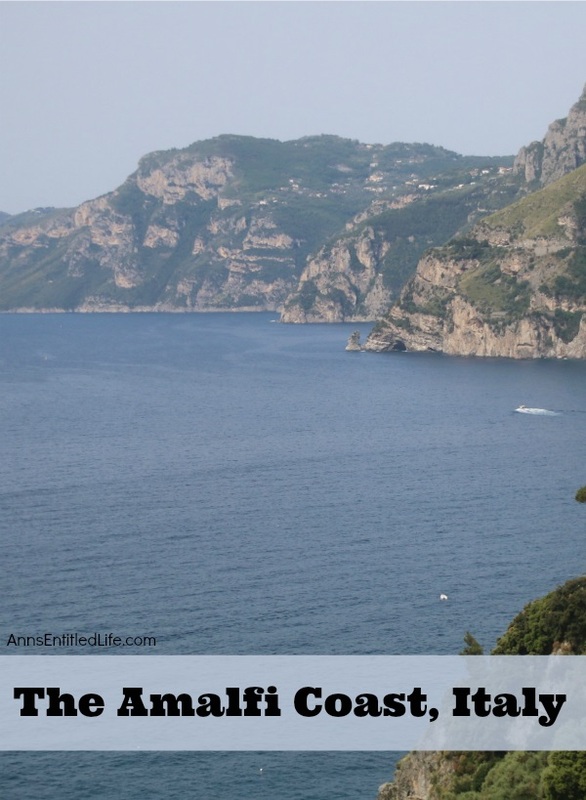 As part of our time in Italy, Hubby wanted to see the Amalfi coast. 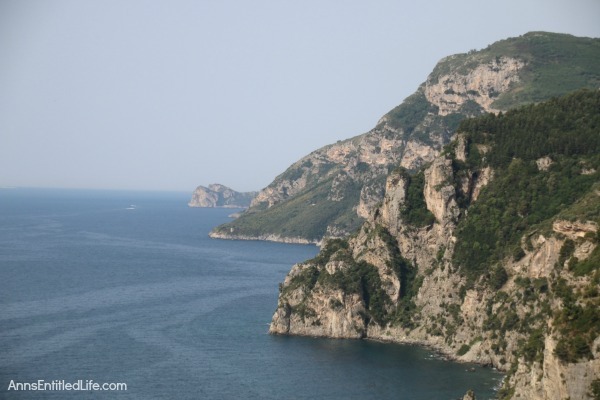 He had considered our staying in Amalfi, but we opted to stay in Sorrento instead. 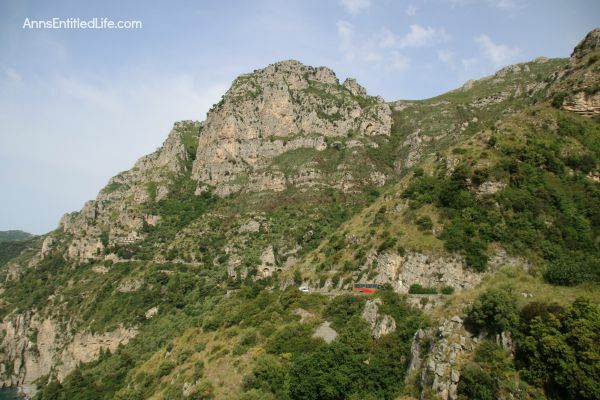 To visit the Amalfi coast down near (and in) Amalfi, we took an all day bus tour. We chose a small excursion as the larger buses are not allowed on part of the road on the coastline, and must detour up and around. 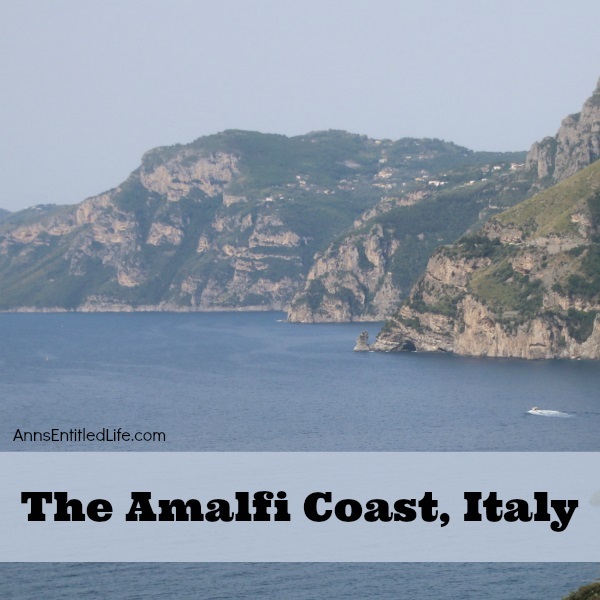 As part of our tour we stopped in Amalfi, as well as Ravello. The parking prices in Amalfi were insane. There was one place to park for buses and the charges were crazy! In the vicinity of 150€ for 2 hours parking if I recall correctly. The food prices were also quite high compared to all the other places we ate in Italy. 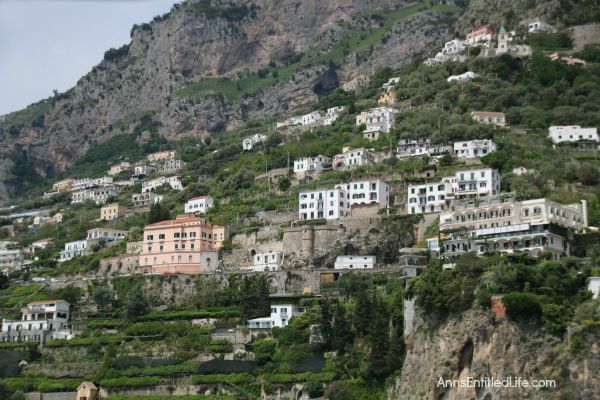 The town of Amalfi itself was extremely crowded. We were there only for a short time and chose to take a boat tour of the shoreline rather than investigate the town itself. I think we made a wise choice. 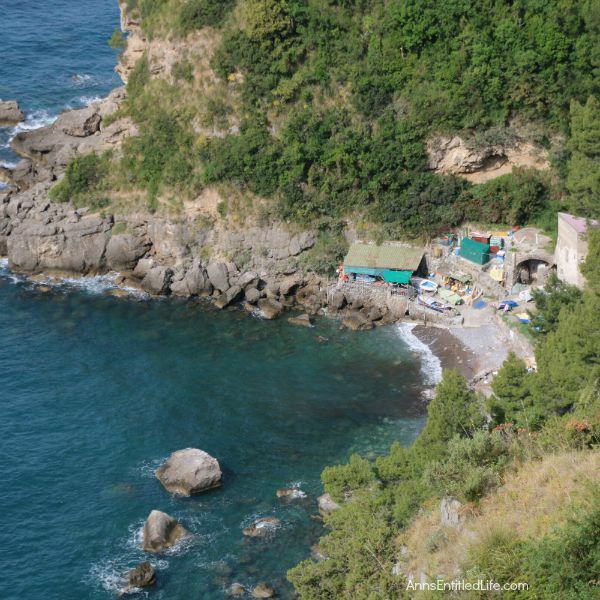 The shoreline was beautiful, the houses we saw were fabulous, the gardens a testament to “where there is a will, there is a way”, and the rock formations were simply stunning. 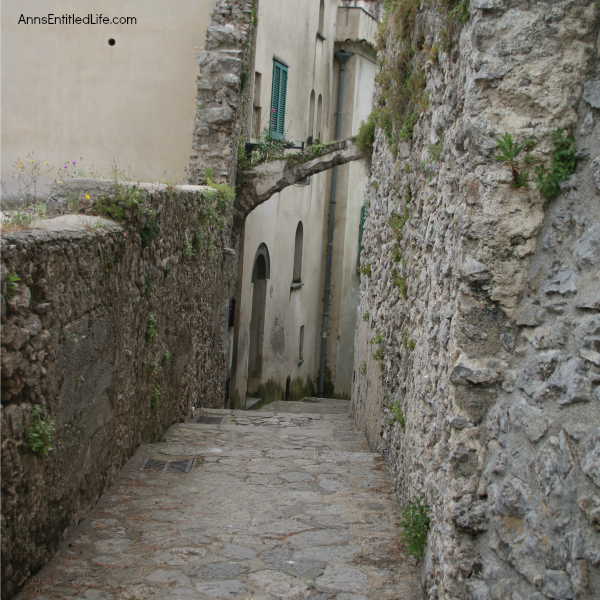 In the town of Ravello, we did a little shopping, saw the ruins and old cathedral, and walked a million more stairs. 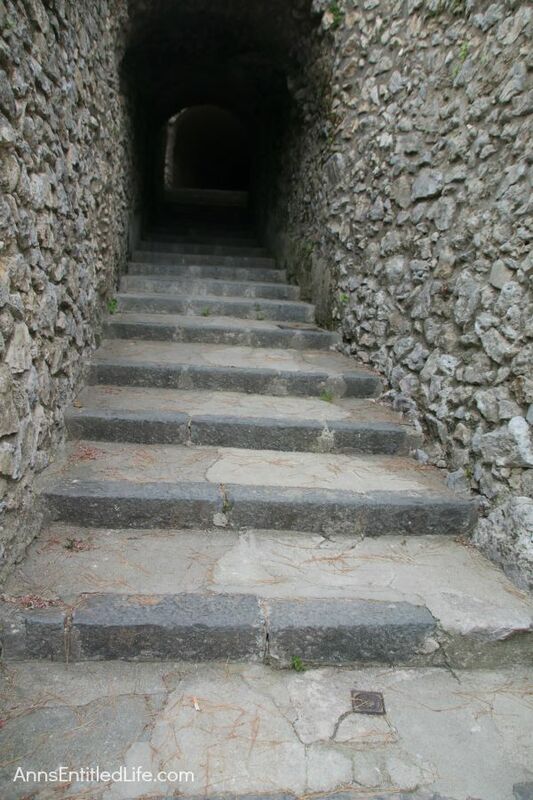 The story of Italy is stairs, stairs, and more stairs. I truly have no idea how the elderly or infirm manage to get around. 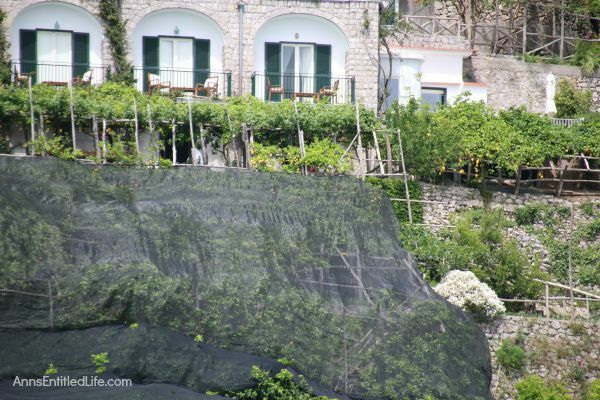 We loaded onto the bus from Ravello on time, but the rest of our group was a bit late. The bus driver was not allowed to linger, so up the road we went to the medieval town of Scala. I’ll tell you, from the little bit we saw, that would be where I’d like to spend a day exploring! This was a little fishing village. Notice how remote? It is not easily visible from above. My photos are from the above left taken from a little cliff where we stopped to see the view. You notice how tiny that village looks in the bottom photo? That just shows you how vast the rocks formations and water really is. The road is rather narrow. We had one encounter where all the vehicles on the road had to stop and back up to allow the municipal bus (the red one which is the only large bus allowed on many parts of the road, and always has the right of way) room to get down the road! The boats were out in full force! Fishing is a large part of the local economy. We ate a LOT of fish while in Italy. There were quite a few ruins about. 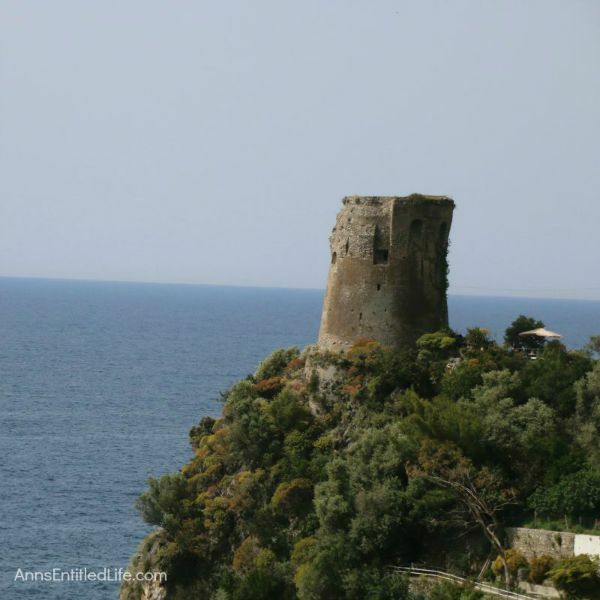 From watch towers to old churches, the Amalfi coast was settled thousands of years ago, and so have a rich history. This is reflected in the ruins. 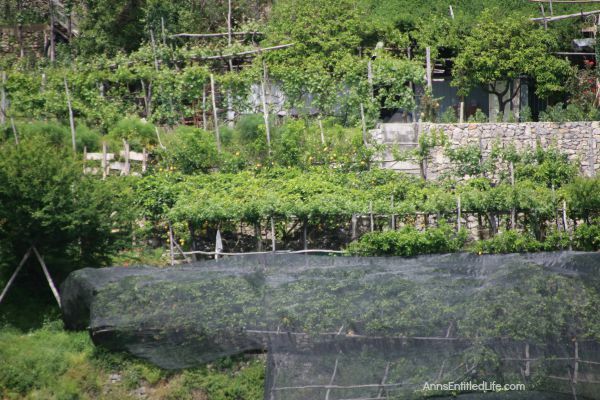 Tiered gardens growing lemons, olives, other citrus and more. Notice the covers to protect the trees? 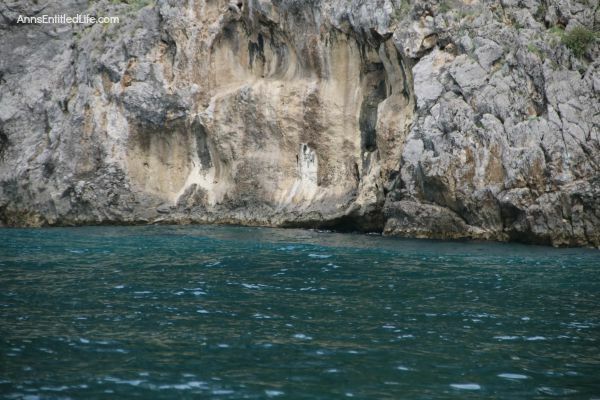 While not as blue as the waters of Capri, the waters off the Amalfi coast were nevertheless quite beautiful! 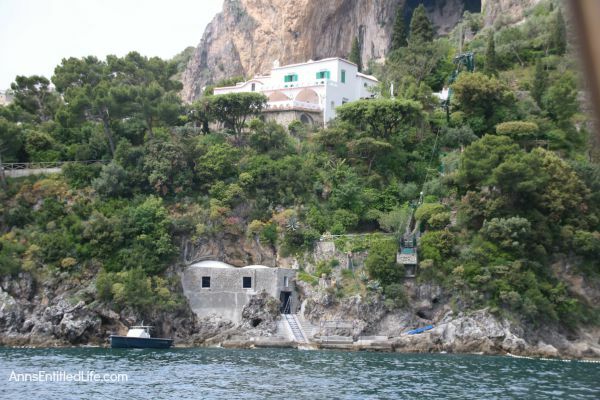 This was (and for all I know still is) Sophie Loren’s Villa. There were other houses pointed out to us as “belonging” to the rich and famous (I recall Roger Moore, but can’t remember the others). 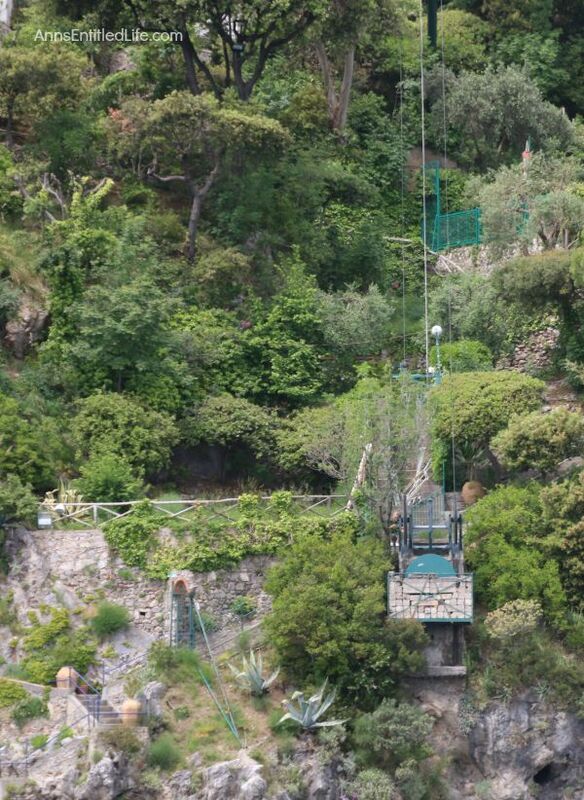 This is how you access the villa via water! You better be in pretty good shape, even with the elevator access. And how is this for a simply stunning view!? 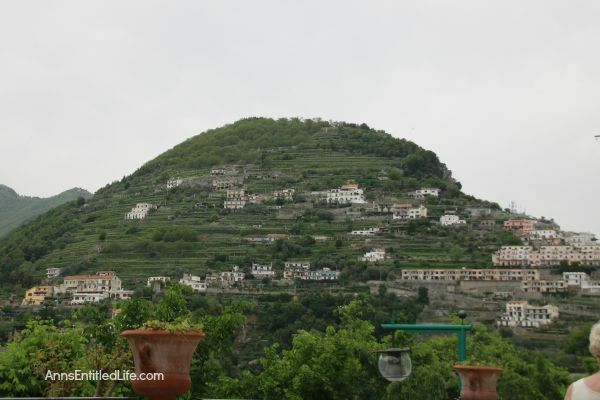 I took these photos in Ravello. Hubby and I basically wandered around, I took some photos of stairs, we took a few hillshide photos, and left. 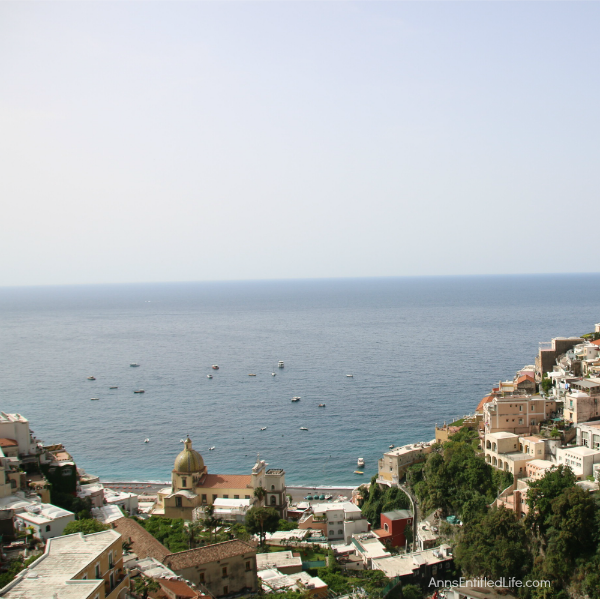 While cooler and quieter than Amalfi, it was also extremely “touristy” for such an old place. While very pretty with simply breathtaking views, I don’t think the Amalfi coast quite lived up to Hubby’s idea of the place. It seemed to be very expensive, although I am certain the locals know the cheap places to eat and purchase goods. While we are glad we went, it is unlikely we will ever return. • For more of the Travel posts on Ann’s Entitled Life, click here. • Note: my instagram page is ALL our travel experinces! If you enjoy travel photography, follow me on instagram! Thanks for sharing these wonderful photo’s with us.